Diwali is also known as the Festival of Light, and it is celebrated all over the world as one of the largest and most important festivals for Hindus. 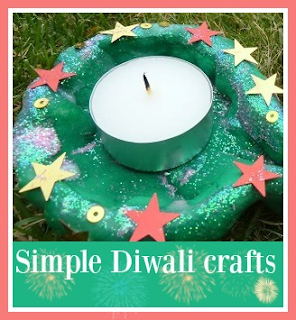 I've come up with several Diwali crafts and activities for my children over the last few years, so I'm grouping them all together in this Diwali round up post so that they are all easy to find. Many of these crafts are particularly suitable for younger children. My most popular craft is my Salt Dough Diwas. One year they were even featured in "Yours" magazine, which I was very excited about! They are really easy to make, and when they are painted and decorated with sequins they are so bright and cheerful. Ours come out now year after year and are still looking as good as the day that we made them. I first discovered Hama beads around Diwali one year, and now of course they are a regular feature on my blog! I used the large and small circle pegboards to come up with a variety of different Rangoli designs. The small Hama bead Rangoli designs make lovely coasters for a Diwali celebration, or as simple decorations stuck or strung around the room. The large Hama bead Rangoli designs were also a lot of fun to make, and make nice table mats or standalone decorations. The circle Hama bead pegboard is really versatile, and with the larger board you can make some really complex designs. They look fab in the centre of the table for a Diwali meal. We've also made some simple Rangoli using dyed rice.These were a bit more fiddly, but looked good and the children had a lot of fun making them. Colouring the rice is really easy and it's fun for the children to get involved. I also tried a different way of making Rangoli, this time Rangoli using dyed salt for a finer texture, and using my Cricut mini to cut out templates for the different areas. I ran them through the laminator to make them nice and sturdy, and they look great stuck on the window. We have also put together some really simple Diwali cards which worked very well using some printable colouring pages, and I'll be using this idea again this year. There are lots of different pictures to colour out there and many of them come from the Diwali story so are a great starting point for telling the story. Finally there are all sorts of sweet treats that you can bake for Diwali. We tried our hand at some Burfi sweets which are very easy to make and use just three ingredients. I have also written a post for my second blog where I have collected together some Diwali crafts, activities and resources, along with a selection of recommended books and toys to help young children learn about the festival. We have several years yet of Diwali crafting ahead of us, and so I'll be updating this post with all our new ideas. I also have a huge Pinterest board filled with wonderful Diwali crafts and activities from around the web, do pop over and visit!